OTONEWS - Mat Osaka Motorcycle Show 2015 to witness the motorcycle manufacturer Honda. In the exhibition, Honda introduced a new concept motorcycle. The name of the motor concept was quite unique. Yes, the motor is called Bulldog. The name chosen is similar to Honda terrier, the Bulldog. 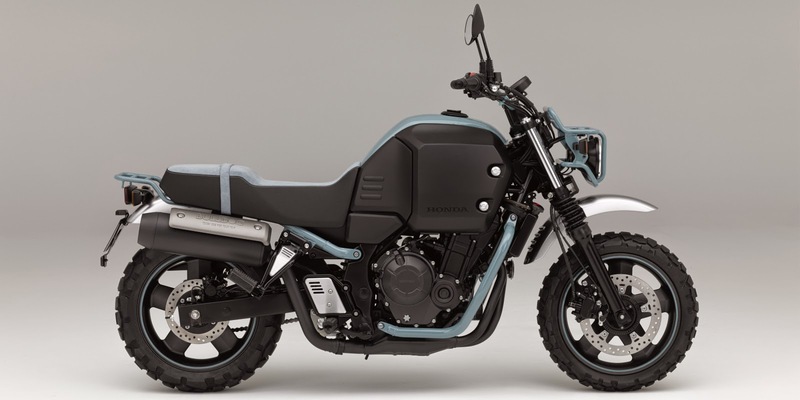 In developing this concept motorcycle, Japanese motorcycle manufacturers have used the concept of "Lovable Touring Partner", similar to the dog that he is a man's best friend. The concept of design is created as a touring bike that is tough on all road terrain. The use of tires wide enough or have the 15-inch size and has a height of 730 mm from the seat to the ground so that the rider can sit comfortably. Go to section tank made with a larger size. Maybe the display tank and presented the characters face Bulldog breed. Spur heart, Honda Bulldog is equipped with engine capacity of 400 cc, 2-cylinder inline, 4-stroke liquid-cooled DOHC. With these machines, Honda claimed this bike in the tough streets of urban and rural. Not only that, the impression of his touring bike is also supported by several storage and accessories are placed on the side of the fuel tank. The plan, the latest Honda motorcycle concept will also be exhibited at the Tokyo Motor Show 2015. No Comment "It Bulldog, Not Dog Name But Honda"